Located in the infamous "pheasant golden triangle," we are an exclusive, all-inclusive South Dakota pheasant hunting destination in Gregory, SD. 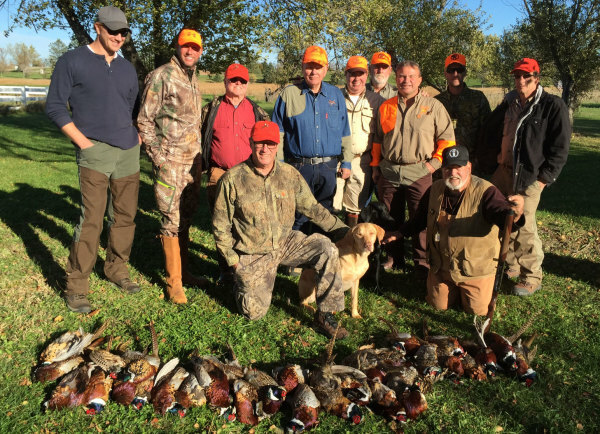 Gregory is ground zero for pheasant hunting, and we have more than 2500 acres of uniquely developed habitat that is world-class. We are located in south/central South Dakota near the towns of Dallas/Winner/Presho/Platte/Chamberlain/Mitchell, SD. The Orchard Lodge is two minutes from the Gregory County Municipal Airport, and roughly two hours from the Sioux Falls commercial airport. Whether you have a large or small group, whether you're accompanied by family and friends, or coming with colleagues and clients, The Orchard Lodge is ready to serve your needs and be your destination of choice this year. We look forward to seeing you at The Orchard Lodge for your hunting experience. Learn more about our South Dakota hunting lodge and feel free to contact us with any questions. Thank you and we look forward to your arrival. "The Orchard Lodge is a yearly escape for my friends and colleagues. Jeff provides the personalized service and the perfect atmosphere, every trip we make."